OŚWIĘCIM, POLAND. 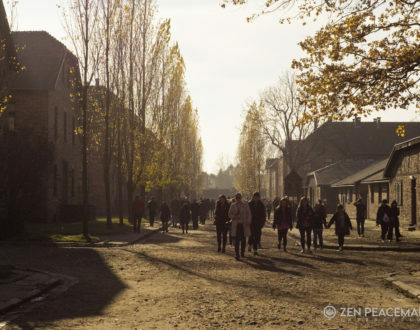 This November 2017, 65 people gathered at the site of the Auschwitz-Birkenau concentration camp for the twenty-second gathering of Zen Peacemakers there. Participants gathered at beautiful Krakow, the location of the old Jewish Quarter. Many of the Jewish people who had lived there were relocated to the Auschwitz camp. Workshops on the Three Tenets (the principles of the Zen Peacemakers,) and Introduction to Council Training were offered before the retreat. The week included multi-faith ceremonies with the opportunity for participants to take part. At the barbed-wire corridor which was used to lead new-arrivals to the camp to the gas chamber, a moment of acknowledgment was held for displaced and persecuted peoples of today. The group visited a nearby monastery where the artwork of a former camp prisoner shows his struggle of survival. Song at the Children’s Barracks. Silent sitting on the selection platform. A moment of silence at this patch of birch trees, a place where many women died. At the largest ash field the group offered the ‘Gate of Sweet Nectar,’ a buddhist liturgy. The retreat offered many opportunities to share in small groups every morning, and in a large spiral council at the Dialogue Center where the group resided. In a pilgrimage around the camp, the group stopped in ceremony, song and silence, visualizing at each stop being in the shoes of the different occupants of this camp: the prisoners, the guards, the wildlife, the towers, the newly arrived, the dying, the escaped, the hopeful, those who witnessed, those who remained, and those who helped. Zen Peacemakers International is grateful to all our participants for giving life to this powerful return to Auschwitz-Birkenau. Many thanks to the retreat leadership: Bernie Glassman, Eve Marko, Andrzej Krajewski, Genro Gauntt, Cornelius Collande, Barbara and Roland Wegmüller, Fleet Maull, Rami Efal, Jared Seide, Reb Shir Yaakov Feit, and to our dedicated staff: Camilla Moesler, Joanna Jakubowicz, Pake Hall, Agneiszka Poliszuk, William Stephans and Lyndsay Lunan & the facilitators team. Special thanks to the Dialogue Center in Oświęcim for their hospitality and care.